The California supreme court today returned the DVD Copy Control Association (DVD-CCA) v. Bunner case to a lower court. John Borland, a staff writer for CNET News.com wrote, basically, that Free Speech has lost - sparking the usual intensive discussion on Slashdot.org, while the competing press release from the Electronic Frontier Foundation touts it as a Victory for free speech. The polarized and oversimplified debate over this case does no one justice. I have long held that previous changes to copyright law in America have been insufficiently challenged. Returning the copyright extension to what the founders meant -14 years, renewable once, and also restoring the right of reversion, lost in the 1920s, is the simplest, cleanest and most elegant way to regain balance. The SIRTF space telescope was successfully launched this morning. Using SIRTF to see in the infrared, scientists will be able to see billions of years into the past and unlock more of the mysteries of the universe. 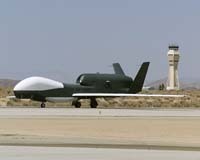 In other news the unmanned surveillance drone, Global Hawk, got approval to fly nearly anywhere in America. The press release stated that this "paves the way for it to support homeland defense missions in national airspace." Great. Now America's law enforcement can see millions of people in the present and unlock their mysteries. You'll note that this aircraft can do it without even a human at the wheel. Efficient, no? We've already seen some penetrating pictures from Global Hawk when flying over Iraq... now it overflies Americans! Technology, the two edged sword! Global Hawk's fully redundant flight control avionics architecture allows it to fly a preprogrammed mission plan autonomously. This architecture, along with the use of systems such as a mode ``S'' transponder, precision altitude and navigation equipment, and UHF/VHF voice relay radios facilitate the UAV's integration and communication with air traffic control. Global Hawk also has the ability to file Instrument Flight Rules (IFR) flight plans, a function not performed to date by any other UAV system. What happens to, you know, life, when there are TV cameras trained on it twenty four hours per day? What happens to manners? What happens to the rules of how we ought to behave? What happens to the judgements we make of other people? When we see someone we know, and perhaps later meet up with, masturbating on camera, or scratching his bum, or having a seriously bad hair day, or cheating (maybe, hard to tell) on his wife, how should we then conduct ourselves? These seem to me to be questions well worth preparing ourselves for. Big Brother (the TV show) is closely linked to the also much complained about "cult of celebrity". But the "cult" of celebrity – which is really just being extremely interested in the lives of celebrities – seems to me to reflect the exact same pre-occupations as the reality TV shows. Celebrities are the people who are already enduring total surveillance. Their triumphs and agonies as they either try to dodge the cameras, or as they make rude finger gestures at them, or else as they try to be dignified when on them, are a taste of what the rest of us may have to be deciding about in years to come. Now the Beckhams, tomorrow it'll be us on camera. How do the Beckhams handle it? How will we? I'm disturbed by how much the surveillance society has already progressed. I was on a bus in San Jose the other day and overhead was multiple dome cameras. Now, overhead, hovering in silence, nearly invisible, will be a Global Hawk. I know that Big Brother exists in all of us. We're all watching each other. It's a game. It has always been. There's no one "side" to it - people will always spy on other people, it seems to be human nature, and with the commoditisation of information I guess we'll get used to it, but I don't have to like it. I howl at the moon every birthday. My last three blog entries came from my disappointment at never making it into the space program. I dropped out of college in the early 80s and went into programming computers for a living. I thought that maybe I'd work my way into space that way, but after the Challenger disaster, I focused on becoming a Delos D. Harriman. That hasn't worked out so well either... neither has my attempt at becoming Rhysling... I just managed to secure a press pass for the upcoming Planetary Sciences conference. Engineer, songwriter, businessman, journalist... If I could just break orbit then I'd be a wanted fan! Occasionally you do have to take a step back, get some perspective, and restore your sense of wonder. Progress in my own field, favorite design method (open source), and OS (Linux) has been amazing. I take comfort in that. I'd been running this invocation of mozilla for 14 days straight. I had 41 browser windows open. As a guess, I'd say I had 15 tabs open, on average. That's 615 web pages all open at the same time! (and several thousand read - I've done nothing but research and write these past weeks) The browser was using 809MB of RAM to do this. Simultaneously I was running open office, and the graphics editing program gimp. With better software, fewer space missions will fail due to bugs like missing semi-colons, priority inversion problems, mistaken metric/english unit conversions, or bits flipped the wrong way. These are all real examples of how bad software caused failures in the space program. A missing semi-colon caused one venus mission to miss, a priority inversion problem ate at the battery of one of the Mars landers, the Mars Polar Orbiter burned because of metric confusion, and the Climate Orbiter had a single bit sensor jiggled during re-entry that stopped the motor firing early, so it crashed. I wrote about these last two software bugs in Uncle Bill's Helicopter. I hope that Linus's Law - "With enough eyeballs, all bugs are shallow" - etches it's way into more minds. My sense of wonder is back.